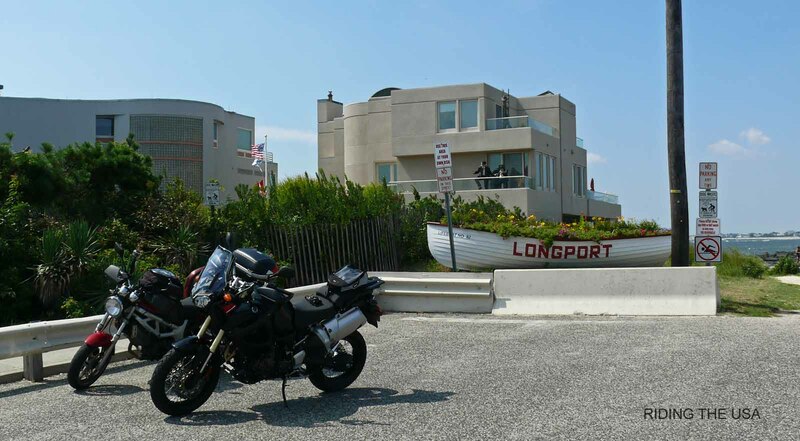 Chris from "Everyday Riding" blog had arrived the night before from Rhode Island. 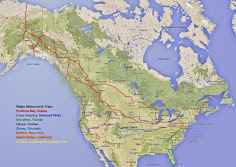 He is a fellow blogger from Minnesota and was in the middle of a “Big Trip” visiting the New England states. I had offered him the overnight stay as hotels near the shore can be expensive. We had spent the previous evening discussing computers, motorcycles and trips in between drinking and swimming in the pool. 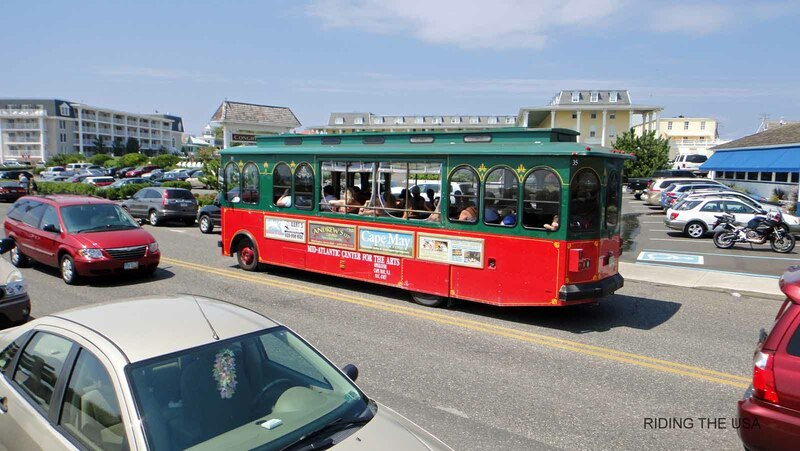 Since he didn't really have a route planned other than ride along the shore, I recommended a trip to Cape May and then take the ferry across the Delaware River to Lewes, Delaware. 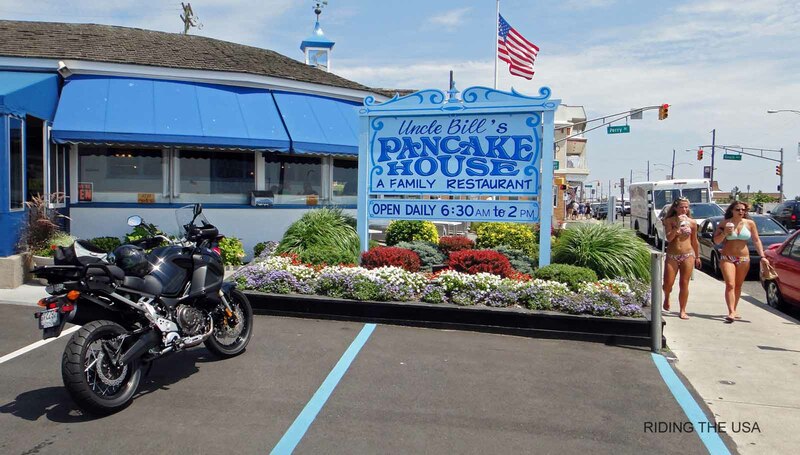 I wasn't planning on riding with him since I had other plans for the day but the weather was beautiful and I needed to put mileage on my new Yamaha Super Tenere, didn't take long for Chris to persuade me into leading him down to Cape May. We left the house and headed south passing the United States Navy Lakehurst Naval Air Engineering Station, the site of the 1937 LZ 129 Hindenburg airship disaster. Last year I got in trouble for stopping and taking pictures in front of the plane so I pointed out the place and we rode past. Chris got a nice photo using his GoPro camera. Refer to his blog for more pictures. 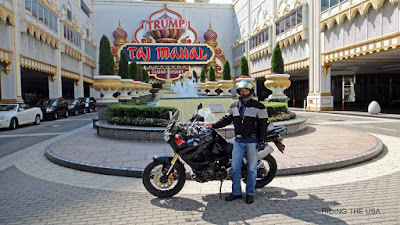 I lead Chris through back roads towards Atlantic City making the first stop in front of the Trump Taj Mahal, known as the The Taj by locals. 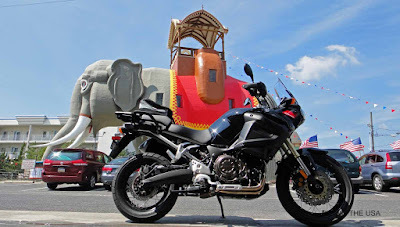 It was a very hot and humid day, we quickly continued down Atlantic Avenue past all the casinos making the next stop in Margate at the famous "Lucy the Elephant", a six-story elephant-shaped example of novelty architecture. Chris took a walk to the beach while I stayed by the bike taking pictures of Lucy, the gigantic elephant was originally constructed of wood and tin sheeting in 1882 by James V. Lafferty. 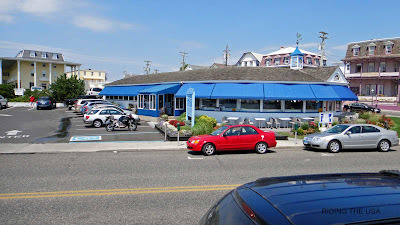 We continue south but soon Atlantic Avenue comes to a dead end in Longport with the Great Egg Harbor Inlet in front of us. 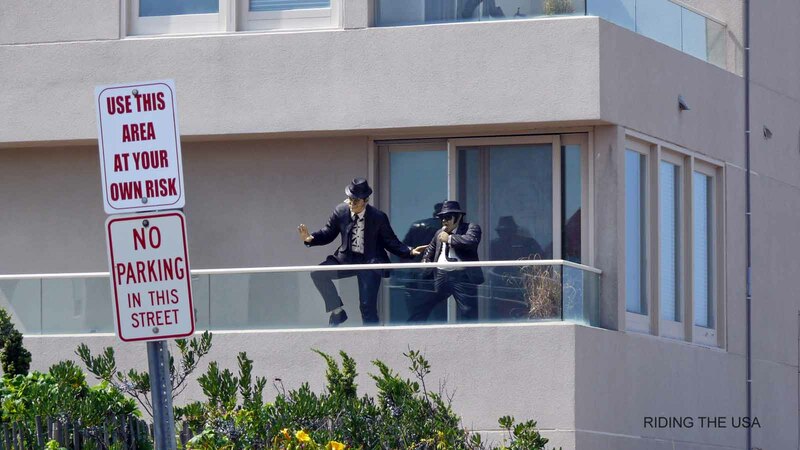 We stop to take a few pictures and that's when I notice two figurines of the famous "Blues Brothers" on a veranda of a home facing the bay. You find the weirdest things in NJ. 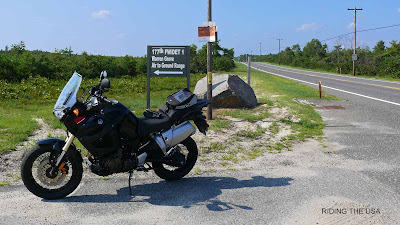 At this point we had to back track to continue towards Cape May and since my new bike does not have a GPS, I asked Chris to lead us out of the area and continue south avoiding highways. We arrive a while later in Cape May with our stomachs rumbling, we ride along the beach looking for a place to eat and we both agree on Uncle Bill's Pancake House where the air conditioner was cranking. After lunch we rode towards the Lewes ferry where we said our goodbyes. I had suggested Annapolis, home of the United States Naval Academy, as a end point for the day. The academy was founded in 1845 and the city is home to some famous buildings, Chris quickly agreed and off he was on his way to the ferry. 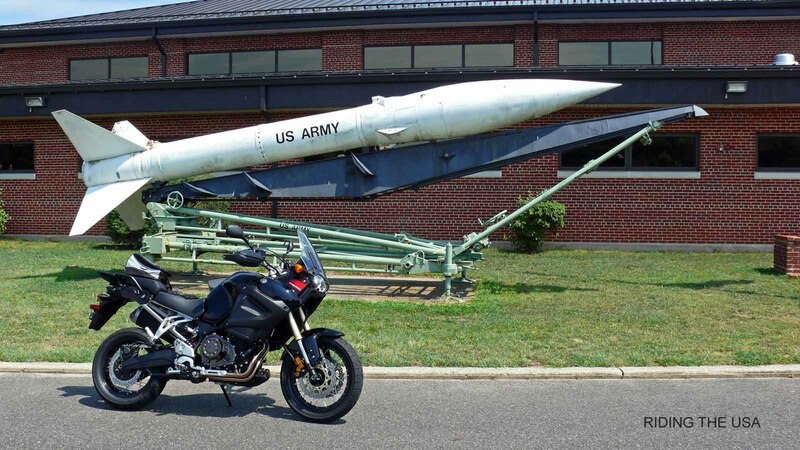 I started my way home stopping at the New Jersey National Guard outpost just outside Cape May for a picture of my new bike in front of the ground to ground missile on display. I made the next stop in the Pine Barrens at a sign I had ridden past but never stopped. 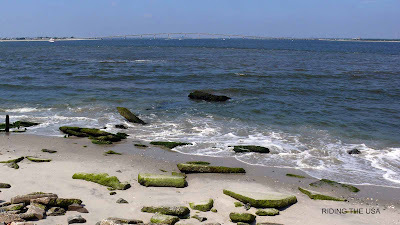 The Warren Grove Gunnery Range is where East Coast Air National Guard units practice bombing and strafing with A-10's and F-16's fighter jets. From my parents home in nearby Manchester we can some times hear the explosions, depending on the wind direction. I have ridden many times through the Warren Grove area and one thing you immediately notice is how different the landscape is. The area is home to the Pygmy Pine Forest of New Jersey, where the trees don't grow any taller than five feet. 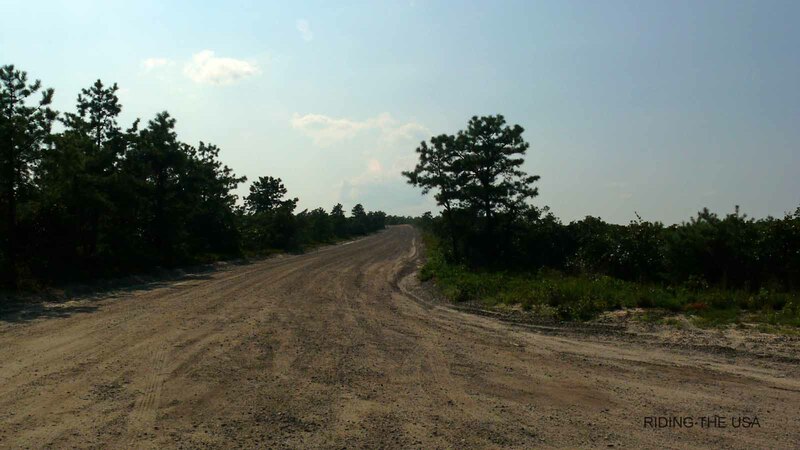 You can get more info on the Pine Barrens here. 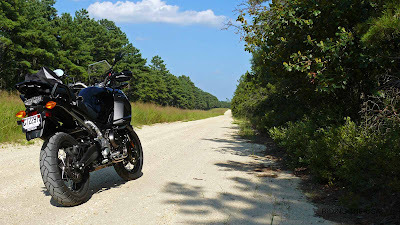 I continue on my way looking for a place to take my bike off road for the first time. 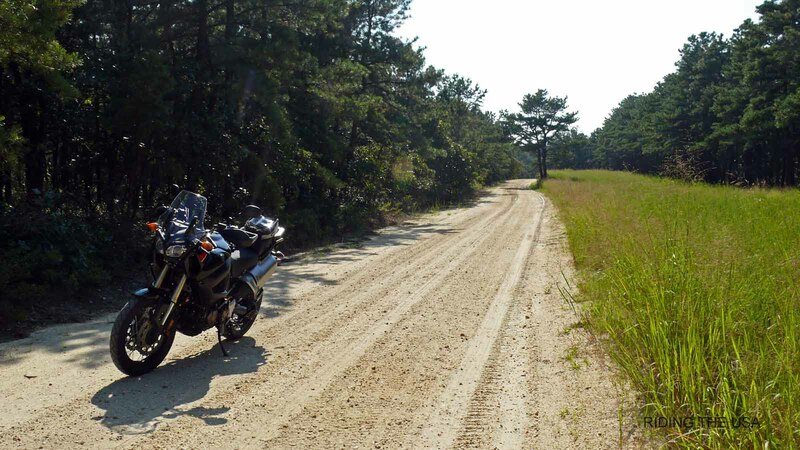 A little further north I see a dirt road going into the Pine Barrens, I quickly take a detour up the trail. The Yamaha Super Tenere is not a small dirt bike, it weighs about 575lbs, I cautiously give it some gas and immediately the traction control kicks in most likely saving me from an embarrassing moment. My heart beats a little faster but I have to try it and give it more throttle, I want to trust the technology behind the advanced traction control. 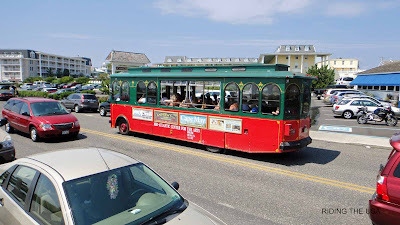 In second gear I give it full throttle, the 100 plus horses kick in, the rear tire wiggles a little, I feel the engine computer interact with the ignition timing and the brakes and the bike quickly accelerates to what are very scary speeds on soft sand. I quickly come off the throttle and apply brakes, mostly the rear and again the clatter of the brake system being controlled by the ABS quickly slows the bike down. I haven't installed the crash bars, this is no time to do crazy stunts and playing in soft sand without knobbies is just plain crazy. I continue a little further up the road and then make a u-turn in the process almost dropping the bike when the front wheel encounters a deep pocket of soft sand, almost like beach sand. I think my heart skipped a few beats right then but I let the bike go where it wants to go and quickly regain full control. I stop for a few pictures and to regain normal heart beat and then continued towards my parent's home where my mom quickly got me a dinner plate and a cold beer, it was already dinner time. It was a nice trip of a little over 200 miles for the day with a riding buddy from Minnesota. Today's ride puts me a little closer to my first service on the bike. I can't wait until I have at my disposal the full power of the bike at 10K rpm's.